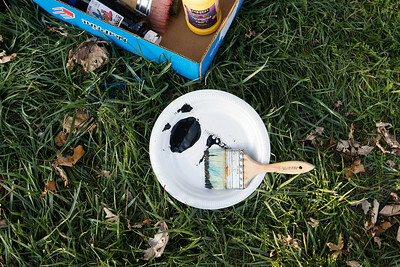 Sarah Nader- snader@shawmedia.com Lindsey Ackman (left), 14, and Caitlan Meyer, 17, both of Johnsburg, help paint windows around Johnsburg Wednesday, Nov. 16, 2016 celebrating the Skyhawks advancing to the semifinal football game against Phillips. 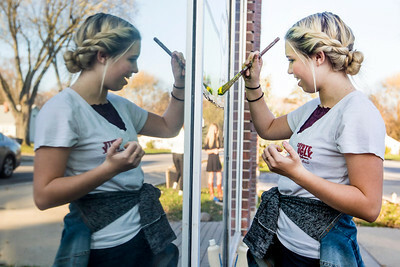 Sarah Nader- snader@shawmedia.com Dance captain Sabrina Vetter, 17, of Johnsburg helps paint windows around Johnsburg Wednesday, Nov. 16, 2016 celebrating the Skyhawks advancing to the semifinal football game against Phillips. 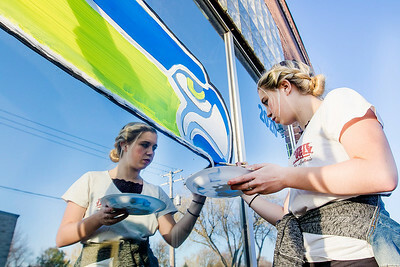 Sarah Nader- snader@shawmedia.com Caitlan Meyer, 17, of Johsnburg helps paint windows around Johnsburg Wednesday, Nov. 16, 2016 celebrating the Skyhawks advancing to the semifinal football game against Phillips. Sarah Nader- snader@shawmedia.com Johnsburg High School cheerleaders, dance team, Jr. Skyhawks cheerleaders and Jr. Skyhawks football team paint windows around Johnsburg Wednesday, Nov. 16, 2016 celebrating the Skyhawks advancing to the semifinal football game against Phillips. 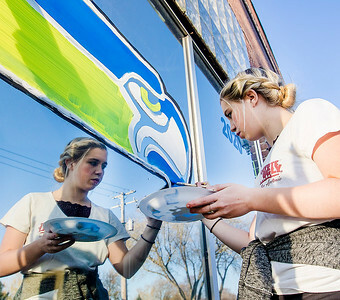 Lindsey Ackman (left), 14, and Caitlan Meyer, 17, both of Johnsburg, help paint windows around Johnsburg Wednesday, Nov. 16, 2016 celebrating the Skyhawks advancing to the semifinal football game against Phillips.